System-1 comes without adjuster and all parts are separate from the wire. 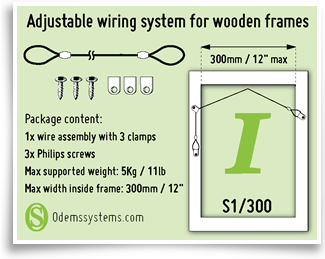 It’s available in 8 lengths and all systems are single packed, including the inlay, screws and clamps and covers wooden frames from (glassdimension) 300 mm - 1200 mm / 11 3/4" - 47 1/4". The single bags can be added into ready-made frames final packing. It saves you time and there will be no need to add a static hanger on the backplate. The single bags are also excellent items for shop-sale to use with canvas-frames etc.